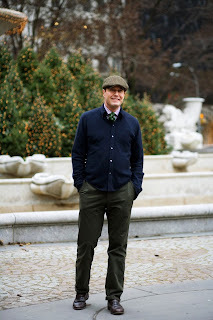 Forget all the hype that's been surfacing in the past few seasons around hats (the cloche a few autumn seasons ago, the fedora made popular by some stylish hollywood ladies, the melon hat as seen on sienna miller, or you know, this season's nice little boat hats every model was sporting down the MJ runway). A woman in a hat will almost always be trying to cover up a bad hair day, except maybe if you know, it's your signature and all, à la Anna Piagi or the late great miss Blow. But for those who know, the real good thing about hats is men sporting them. Last winter during my 5 month stint in New York City, there is one thing that was always consistent no matter how cold or how hot it would get. 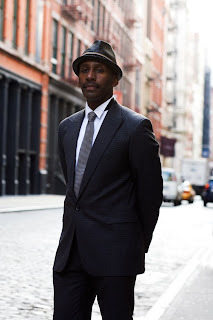 Walking around in any given neighborhood at any given time on any given day, the chances of running into an impeccably well dressed gentleman, headwear and all, were very high. 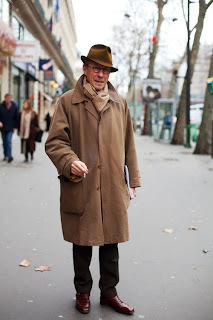 There's nothing i find more charming and debonair than an older gentleman with a fetching topper (and by older i mean not teenagers and boys in their 20s Pete Doherty-ing it up, i mean dapper handsome fellas in their 40s and up). Isn't it just so incredibly suave, especially for the older ones who most likely still carry lids out of tradition? You know, hats used to be an essential part of a gentleman's ensemble if he were to leave the house. As a matter of fact, it was so essential that not wearing one would be a sign of disrespect, not only to others but themselves as well. 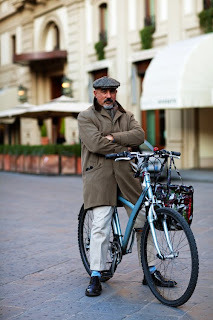 And a man's choice of headwear was highly indicative of his status: "The angle at which headwear is worn could indicate a jaunty attitude, rakishness, dandification, respectability or no-nonsense personality. A hat that was worn or stained showed a man living a hard life, a new looking, well blocked hat would show a more genteel lifestyle." What was once considered mandatory is now a fancy accessory. How dreamy! 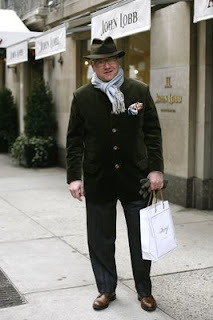 Anyway, i can't help but swoon every time i cross paths with a snappily dressed gentleman showcasing one of fashion's most convenient accomplices: the hat. A man in a hat says to me: chic, dashing, put-together, stylish, confident and above all, it defnitely adds handsomeness to its bearer. 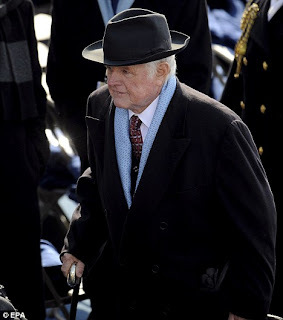 If you watched Obama's inauguration, you must have noticed that the best dressed politicians were the ones with lids? 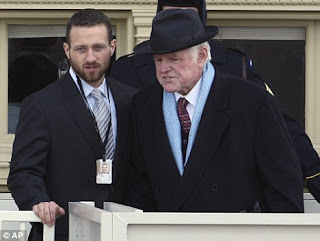 But my number one shining star of the event was Ted Kennedy, who surely either got the memo about men in hats, or he is just sealing the association of style to the Kennedy name.